In November 1971, Fred Kleinberg, Myron Kaplan and Norris Wolff, just two to four years into their legal careers, decided to leave large, “Wall Street” firms to form their own law firm. Jim Cohen, an “old,” “experienced” attorney in his sixth year of practice, via two “Wall Street” firms, joined the firm a few months later. We have grown since then, primarily by making bright, creative, capable associates into partners. All of us share the client focus, entrepreneurial spirit and commitment to legal excellence on which the firm was founded and which has been a major factor in the firm’s development. It feels like we have all been practicing together since we started in 1971. In the years since Kleinberg Kaplan was formed, many law firms, both large and small, have disappeared or become endangered species. We think this trend is largely a symptom of attorneys who view themselves and their clients as commodities. By contrast, we really enjoy practicing law together as true partners, solving problems for clients and sharing our vision of the future. November 2016 marks our 45th anniversary as a secure and growing law firm. We believe that we are one of the longest-lived multi-practice law firms of our size in New York City. Withstanding the test of time requires a blend of talent, hard work, client focus, enjoying the craft of the practice of law and luck. But mostly, it requires the loyalty of clients, colleagues and friends. 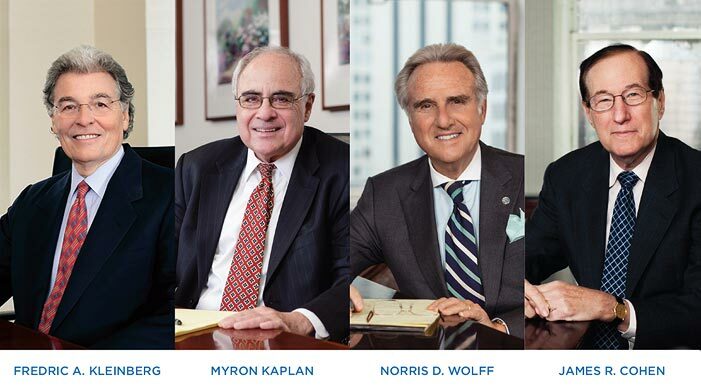 We feel that this is an appropriate place for the four founding partners, who have spent almost 40 years practicing law together, to share a few thoughts about our firm and our practice of law. Our dream, when we left the “secure” world of the large law firm to start our own firm, was to find the best of all possible worlds in the practice of law. We wanted to be part of a smaller firm that would provide the highest quality, most sophisticated, legal product one could find; we wanted to be part of a team effort, where partners loved the practice of law, respected each other as people and as lawyers, and had a shared vision of the future; and we wanted to represent clients who understood the complexity of the law and appreciated receiving service from young, bright and bold lawyers. When we first started the firm, some of our contemporaries thought we were crazy. In some ways we were. We had a dream; we took a risk in pursuit of that dream, and we have enjoyed the most wonderful experience practicing law together for almost 40 years as partners and as friends. What makes us unique is the person inside the lawyer, the person who has the sense and sensitivity to care about our clients, to feel their problems and to understand their goals and needs. When the firm started in 1971, there were just five of us (the four partners could afford only one secretary); we were all in our mid-20’s. Today Kleinberg Kaplan employs almost 90 people, made up of partners, counsel, associates, paralegals, managers, assistants, secretaries, word processors, bookkeepers, accountants, facilities personnel, file personnel and receptionists. We and our employees have grown together, worked together and celebrated marriages, births, anniversaries and other happy occasions together and supported each other through some difficult moments. We appreciate our entire staff, each and every one of them, for their hard work and dedication. I never thought I’d miss the days when opposing counsel would ask to speak with my father. (I was considered too young to be a name partner in a law firm.) One of the reasons we understand and enjoy representing entrepreneurs (in their own businesses or fighting for their own points of view in Fortune 500 or similar companies) is that we remember our beginnings in a small, temporary two-room office, where we had to take turns signing up for the “partner’s office” in order to meet our clients. We had the “foresight” to lease our first permanent office space way in back, about a mile away from the elevator, where it would be quiet (and, as it turned out, hard to find!). But it never was quiet. We have been active in the securities industry and in the fast paced financial services arena since our inception. One of the most important of our first clients was a broker/dealer which specialized in underwritings no one else would consider. Fortunately, the size and quality of the securities industry participants we represent has expanded exponentially since then. We have consistently allocated some of our time to pro bono publico services. At the beginning of the firm, I remember being active in projects and organizations involving recycled paper, other environmental and civic issues and child-safe toys. Within our first year, the firm took a pro bono emergency appeal to the New York Court of Appeals, on which all of us (attorneys and staff) worked throughout a holiday weekend. The decision in this child custody case redefined the “best interests” of the child legal standard in New York. Today, partners remain active in many educational and other charitable institutions. It is part of the reason we enjoy our practice of law. Since American law is based, in large part, on precedents — that is, decided cases — determined in the courts, a particular joy for us is to point to litigations which resulted in precedents that not only helped our clients, but changed and contributed to a body of law. This is a special delight for a litigator. We are very proud of the fact that our cases have resulted in over a hundred officially reported decisions, many of which have been cited in law reviews and other legal decisions, and thus have helped not just our clients, but also others similarly situated. Over the years, our litigation practice has grown. Our earliest cases were often collection matters or simple commercial disputes. Today, we regularly handle complex national litigation in federal and state courts at the trial and appellate levels as well as national and international arbitration for multinational companies, hedge funds, institutions, entrepreneurs and Fortune 500 and even some Fortune 100 companies. 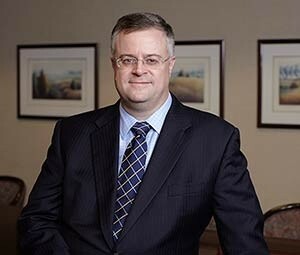 We have earned a well-established reputation for corporate, commercial, construction and securities litigation and arbitration. What a pleasure it has been to watch our tax and estates group grow from just me to nine attorneys and two paralegals. The hedge fund industry, where we have spent many interesting hours since the mid-1970s, is a great arena in which to exercise one’s tax ability, thoughtfulness and creativity. Hedge fund managers are bright, creative and appreciate when value is added. Something new and beautiful often occurs when a creative hedge fund manager and his or her counsel meet to solve a problem. Estate planning and administration is a fascinating and greatly changing area of law. The tax consequences have grown tremendously in the last decade as a great deal of wealth has built up in the most senior generation. The one constant, and the estate practitioner’s greatest challenge and reward, is helping someone who is planning his or her estate, or is the beneficiary of a decedent’s estate, deal with difficult issues under stressful circumstances. We plan more than 100 estates each year and are currently administering more than 35 decedents’ estates, some small and some very large. It gives us pleasure each time we help a client plan for the distribution of his or her assets in accordance with his or her goals and with the least possible tax cost. It gives us pleasure to plan for the continuity into the next generation of entrepreneurial businesses of all kinds. It gives us pleasure to plan business structures and transactions with the smallest possible tax friction. We look forward with enthusiasm to continuing our tax and estates practice into the future.